One of the challenges of teacher education is to train preservice teachers to deliver a wide range of literacy skills to a diverse population. This article describes a mixed methods research study into preservice undergraduate literacy methods courses. This research examined how online, asynchronously conducted discussions influenced and impacted preservice teachers' literacy understanding. Providing many opportunities for supportive and interactive online dialog enabled the preservice teachers to develop a richer base of literacy learning knowledge. Specifically, the study demonstrated how asynchronously conducted discussions supported preservice teachers in acquiring and refining the content and pedagogical knowledge needed to teach literacy. Courtney, A. & King, F.B. (2009). Online Dialogue Discussion: A Tool to Support Pre-Service Teacher Candidates’ Understanding of Literacy Teaching and Practice2. 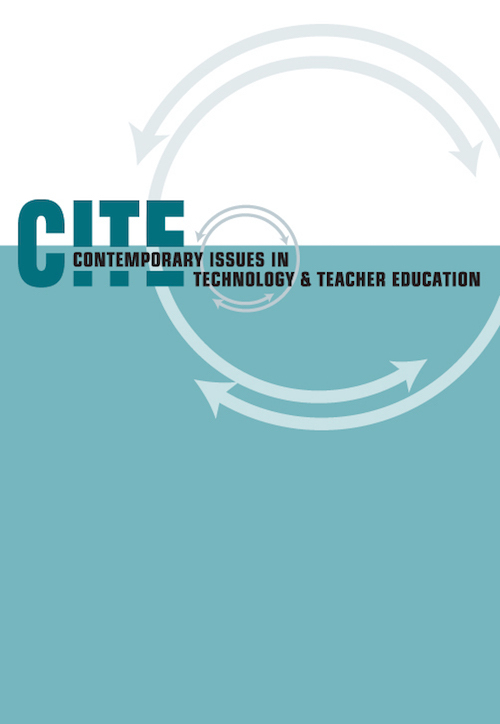 Contemporary Issues in Technology and Teacher Education, 9 (3), 226-256. Waynesville, NC USA: Society for Information Technology & Teacher Education. Retrieved April 20, 2019 from https://www.learntechlib.org/primary/p/24204/. Bransford, D., Brown, A., & Cocking, R. (2000). How people learn: Brain, mind, experience and school. Washington, DC: National Academies Press. Brewer, S., & Klein, J.D. (2005). Type of positive interdependence and affiliation motive in an asynchronous, collaborative learning environment. Educational Technology Research& Development, 54(4), 331-354. Brown, A.L. (1997). Transforming schools into communities of thinking and learning about serious matters. American Psychologist, 52(4), 399-413. Brown, A.L., & Campione, J.C. (1990). Communities of learning and thinking, or a context by any other name. In D. Kuhn (Ed. ), Contributions to human development: Vol. 21. Developmental perspectives on teaching and learning thinking skills. (pp. 108-126). Cole, A.D. (2004). When reading begins: The teacher’s role in decoding, comprehension, and fluency. Portsmouth, NH: Heinemann. Daniels, H. (2001). Literature circles: Voice and choice in book clubs and reading groups. York, ME: Stenhouse Publishers. Duffy, T.M., & Jonassen, D.H. (1992). Constructivism and the technology of instruction: A conversation. Hillsdale, NJ: Lawrence Erlbaum Associates, Publishers. Ferdig, R.E., Roehler, L.R., & Pearson, D.P. (2002) Scaffolding preservice teacher learning through Web-based discussion forums: An examination of online conversations in the Reading Classroom Explorer. Journal of Computing in Teaching Education, 18(3), 87-94. Goodman, K. (1986). What’s whole in whole language? Richard Hill, ON: Scholastic. Goodman, Y., Watson, D., & Burke, C. (1987). Reading miscue inventory: Alternative procedures. Katonah, NY: Richard C. Owens. Halliday, M.A.K. (1973). Explorations in the functions of language. New York: Elsevier North-Holland. Halliday, M.A.K. (1975). Learning how to mean: Explorations in the development of language. London: Elsevier. Holdaway, D. (1979). The foundations of literacy. Sydney, Australia: Ashton Scholastic. Jonassen, D.H., Peck, K.L., & Wilson, B.G. (1999). Learning with technology: A constructivist perspective. Upper Saddle River, NJ: Merrill. Kearsley, G. (2000). Online education: Learning and teaching in cyberspace. Belmont, CA: Wadsworth/Thomson Learning. Kinzer, C.K., & Risko, V.J. (1998). Multimedia and enhanced learning: Transforming preservice education. In D. Reinking, M.C. McKenna, L.D. Labbo, & R.D. Kieffer (Eds. ), Handbook of literacy and technology: Transformations in a post-typographic world (pp. 185-201). Mawah, NJ: Lawrence Erlbaum. Longhurst, J., & Sandage, S.A. (2004). Appropriate technology and journal writing: Structured dialogs that enhance learning. College Education, 52(2), 69-75. Lynch, M.M. (2002). The online educator: A guide to creating the virtual classroom. New York: Routledge. McCombs, B.L. (2001). What do we know about learners and learning? The learnercentered framework: Bringing the educational system into balance. Educational Horizons, 79(4), 182-193. Norton, P., & Wiburg, K.M. (2003). Teaching with technology: Designing opportunities to learn (2nd ed.). Belmont, CA: Wadsworth/Thomson Learning. Orwocki, G. (2003) Comprehension: Strategic instruction for K-3 children. Portsmouth, NH: Heinemann. Palloff, R.M., & Pratt, K. (2007). Building online learning communities: Effective strategies for the virtual classroom. San Francisco: Jossey-Bass. Phinney, M. (1988). Reading with the troubled reader. Portsmouth, NH: Heinemann. Rhodes, L., & Dudley-Marling, C. (1996). Readers and writers with a difference: A holistic approach to teaching struggling readers and writers (2nd ed). Portsmouth, NH: Heinemann. Scardamalia, M., & Bereiter, C. (1994). Computer support for knowledge-building communities. The Journal of the Learning Sciences, 3(3), 265-283. Schunk, D.H. (2000). Learning theories: An educational perspective (3rd ed.). Upper Saddle River, NJ: Prentice-Hall, Inc.
Singh, H.. (2004). Succeeding in an asynchronous environment. In G.M. Piskurich (Ed. ), Getting the most from online learning. San Francisco: John Wiley& Sons, Inc.
Smith, F. (1986). Understanding reading. (3rd ed). Hillsdale, NH: Erlbaum. Smith, F. (1997). Reading without nonsense. (3rd ed). New York: Teachers College Press. Snow, C., Burns, M., & Griffin, P. (1998). Preventing reading difficulties in young children. Washington, DC: National Academy Press. Strauss, A. (1987). Quantitative analysis for social scientists. New York: Cambridge University Press. Swan, K., & Shea, P. (2005). The development of virtual learning communities. In S.R. Hiltz& R. Goldman (Eds.). Learning together online: Research on asynchronous learning networks (pp. 239-260). Mahwah, NJ: Lawrence Erlbaum Associates. Teale, W., Leu, D., Labbo, L., & Kinzer, C. (2002). The CTELL project: New ways technology can help educate tomorrows reading teachers. The Reading Teacher, 55(7), 654. Weaver, C. (2002). Reading process and practice. Portsmouth, NH: Heinemann. Wegerif, R. (1998). The social dimension of asynchronous learning networks. Journal of Asynchronous Learning Networks, 2(1), 34-49.